Netflix is finally ready to deliver individual profiles for its streaming service, meant to satisfy households with shared accounts by providing everyone their own settings, viewing history and (where available) queue. Profiles are coming to all Netflix regions starting today, but may take a couple of weeks to appear on every account as they roll out gradually. Device support will also take some time to hit everywhere even though most clients (the PS3 is shown above) are ready for profiles today. Two platforms not yet sorted are Android and the Nintendo Wii, where support will arrive "later in the fall" and in mid-August, respectively. Once the new feature is available however, it should be easy for users to access and setup, as we learned from Chief Produce Officer Neil Hunt that focusing on ease of use was the company's main priority. We've also had a chance to check it out ourselves, check after the break for a few more details and quick video preview. Longtime Netflix users will recall that as a primarily DVD-by-mail company it had previously offered individual profiles, but company executives cited its low adoption rate as something they wanted to avoid this time around. Much more than any technical issues or allowing for multiplatform support, making sure the process for setting up and using profiles is as simple as possible has kept this feature baking for so long. In its use, that drive for ease of use affects how it works in a number of ways, enabling it is as easy as clicking a large plus sign and typing in each person's name and selecting a persona logo. Each profile can link to a different Facebook account if you like, however be advised that it automatically pulls in your profile pic for the avatar. As far as setup, that's it. It's like having a brand new account otherwise, with the opportunity to seed preferred content and ratings just like any other new user. From the master account settings and profiles page you can tailor each one for things like age, or even parental suggestions, although a true lockdown this isn't. There are no passwords or other hurdles separating the leap from one profile to another, which the team compared to "locking all the doors in your house." Other settings like preferences for language, closed captions, bandwidth and of course Netflix's taste suggestions are all individual for each profile. This is more about keeping each person's suggestions and any social network tie-ins separate than anything else, and for that it works perfectly in our testing. We're still waiting to try it out on devices other than the PC, but based on our earlier demos we expect a process even more streamlined than the old Kids Zone prompt. We'd like to see even more control in the future, with toggles for locking different playback devices to certain profiles or age-gated content, and the ability to disable the extra step of profile switching at will. For now, profiles are a welcome -- if seemingly late-arriving -- addition, let us know when they hit your account and how they're working out for you. NETFLIX BECOMES EVEN MORE PERSONAL WITH "PROFILES"
LOS GATOS, Calif., Aug 1, 2013 -- Netflix, Inc. (NASDAQ: NFLX), the world's leading Internet television network, today introduced "Profiles," a new feature that makes it easier for everyone in the household to get the most out of Netflix. Starting today, Netflix members can create a separate "profile" for each member of their household, who will each see a uniquely personalized experience based upon their individual watching habits, their personal favorite shows, and favorite genres, all driven by Netflix recommendation technology. Each account can have up to five profiles, included at no extra cost in the basic subscription price. "We continually innovate and are proud to deliver an even better, more personal Netflix experience," said Netflix Chief Product Officer Neil Hunt. "Now everyone in your home can have their own Netflix experience, built around the TV shows and movies they enjoy. No longer will your Netflix suggestions be mixed up with those of your kids, a significant other, roommates, or house guests." Each profile can be connected to a different Facebook account, providing friends-based suggestions and further personalizing the discovery experience. It will also be even easier to enter Netflix Kids, an area with titles appropriate for those 12 and under. 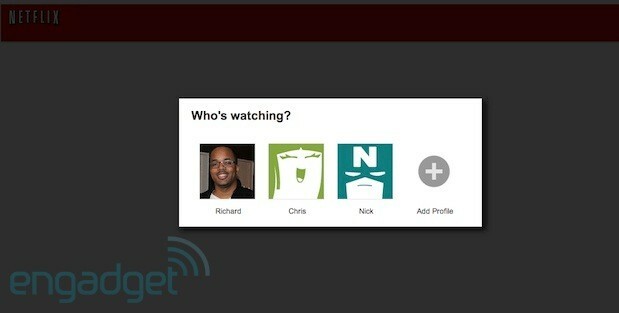 Profiles starts rolling out on Netflix globally on Aug. 1 and will be available to all members within two weeks. New members can add profiles for each member of their family while signing up for Netflix, and existing members can create additional profiles at any time on the Netflix website or on PlayStation 3. Profiles can be accessed on most devices that support Netflix, including the Netflix website, PlayStation 3 and Xbox 360, iPad, iPhone, AppleTV and other iOS devices, and most smart TVs. Additional devices will be added over the coming months. About Netflix Netflix is the world's leading Internet television network with more than 37 million members in 40 countries enjoying more than one billion hours of TV shows and movies per month, including original series. For one low monthly price, Netflix members can watch as much as they want, anytime, anywhere, on nearly any Internet-connected screen. Members can play, pause and resume watching, all without commercials or commitments. Learn more about how Netflix (NASDAQ: NFLX) is pioneering Internet television at www.netflix.com or follow Netflix on Facebook and Twitter. He has filed a $1 billion lawsuit against Apple. The terms of their settlement remain unclear, though.